Today Kyle Busch won the Food City 500 in Bristol, Tennessee. I know because I live in Bristol. Liza lives here too, and she snapped these photos for us today. With over 160,000 people in attendance, Nascar fans enjoyed perfect conditions for a day of racing. Sunny and 80 degrees made for a day where the only thing race fans had to fear was a sunburn. Very different from last year when fans enjoyed snowball fights! 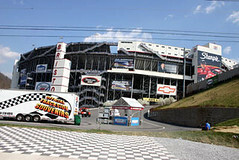 Nascar is not really my cup of tea, but alot of folks love it and it certainly helps the economy here. 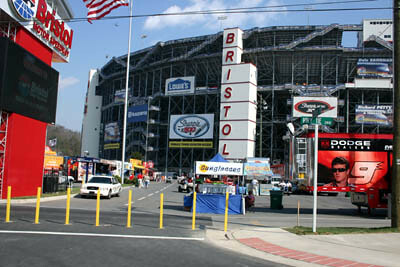 The Bristol Speedway is billed as the fastest half mile track in the world. 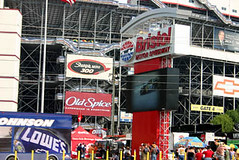 Race car fans are always delighted with the speed and spills guaranteed by Bristol. Locals (without a ticket) mostly stay home, out of the traffic, and watch this auto spectacular from the safety of their TVs. I know when I was a very young girl, this track was nothing more than a dirt track out in the middle of a cow pasture used for good-ole-boy-Saturday-night racing. You know, your Ford against my Chevy. It was all about the cars and who could go faster. Not much has changed. Today, Kurt Busch’s decal covered racer was a Chevy!